For those of you just getting started with your CrewFire accounts – first, thank you! We’ve worked to build the most effective sharing tool for you and your team, and we’re excited to see how you’ll use CrewFire to drive more traffic to your content, products, and services. We designed CrewFire to be dead simple. First, build your list of ambassadors who will share your content for you on their personal Facebook, Instagram, and Twitter accounts. Your team is the core of what makes CrewFire so powerful. Everybody – each of your fans, customers, and employees – has their own unique network of friends and followers who see what they post. As you build your list, the number of people who will see your message will grow exponentially. ==> To build your list, log in the CrewFire and click over to your People tab. Then click on “Add People”. 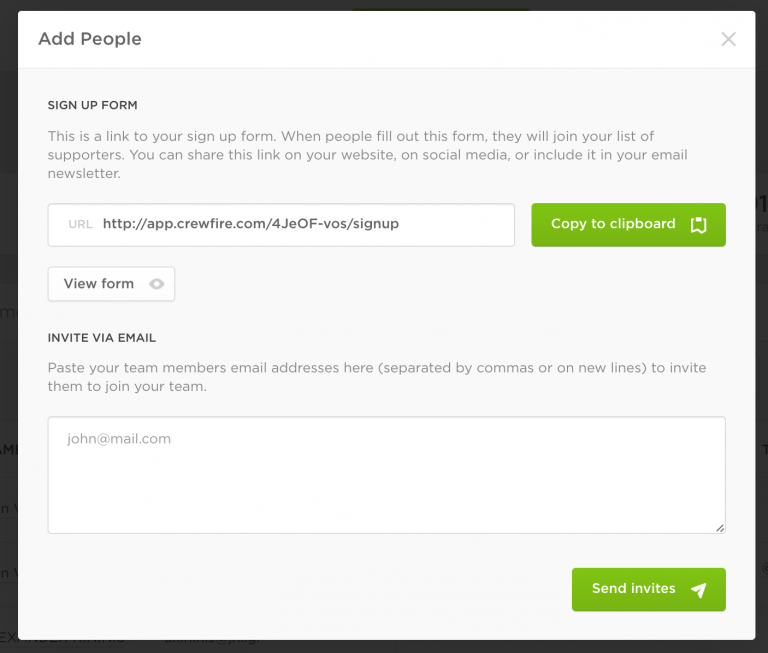 Then you have two options: you can either send out your custom sign up form URL or you can enter your team member’s emails and CrewFire will send out the invitation emails for you. After you’ve built your list of supporters, you can create posts for them to share on Facebook, Instagram and Twitter. The posts can include text, links or images. This is your content, your message that will be amplified as each of your team members posts it on their own Facebook, Instagram and Twitter pages. ==> To create a new campaign, after you’ve recruited your first team member, just hit the New Campaign button. These reports will give you quick insights into your team’s performance as a whole and on an individual basis, so you can spend less time worrying about who’s doing what or what’s working, and more time working on your business. 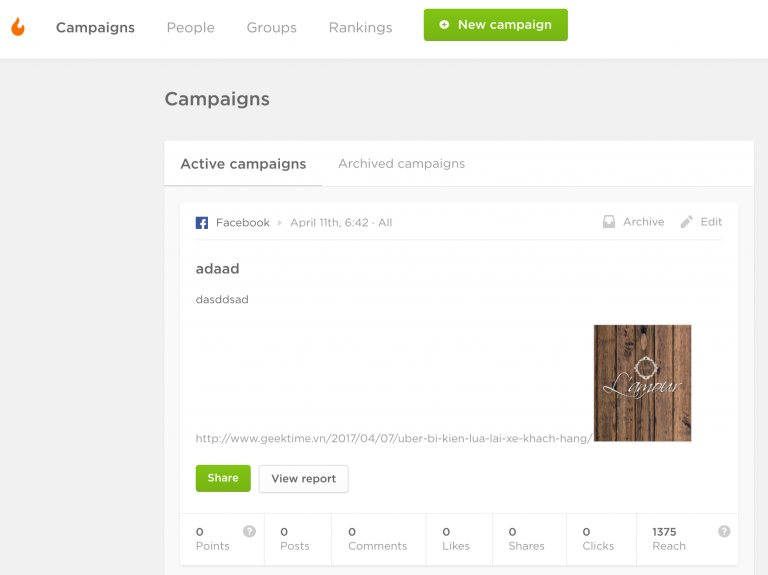 ==> The reports will automatically appear on your Dashboard after you launch your first Campaign. If you want to dig even deeper into the numbers then simply click on the “View report” button and you’ll gain insights down to the performance of each individual team member. And that’s CrewFire: Effective, Powerful, Simple. Over the next few days, keep your eyes peeled for more helpful posts include common pitfalls and best practices from me. And, as always, please feel free to email us at [email protected] if you have any questions, sticking points, or feedback. Thank you again for your interest in CrewFire. We hope you enjoy your trial.